Enjoy some meditative greenery and cultivate your own delicate bonsai tree with this kit. Patience is a virtue. The centuries-old Japanese tradition of bonsai stems from the meditative pursuit of the essence of nature over years of cultivation. Begin your exploration of this horticultural tradition with these bonsai specimen kits. 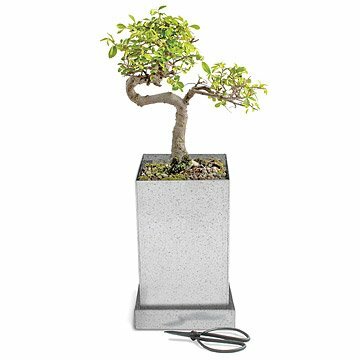 Each one includes everything you need to start growing your own Japanese elm bonsai tree--seeds, growing medium, bonsai pruners, detailed directions, and a recycled US steel grow box. A tree with classic character, Japanese Elm (Zelkova serrata) makes a truly distinctive bonsai. Long, delicate branches with small, serrated leaves that turn orange and yellow in autumn give this tree year-round appeal. It's considered to be one of the best bonsais for winter, when its array of attractive branches are not hidden by leaves. Kit made in Idaho. Photo shows the elm at 4 years old. I will definitely be adding on to my Bonsai tree collection. If you don't have a green thumb this is a perfect way to start and boost your confidence in growing something. Not one of the seeds sprouted after 60 days. I followed the instructions provided to a tee. The kit is easy and gorgeous! You have to plant the tree by yourself. By the looks of the photos it appears to be a full grown little tree. I feel like it was false advertising. Bought this for my boyfriend for his birthday. He's very interested in Bonsai, and was super excited to receive this. I love plants, and I have three baby trees growing so far! It's early to comment because I haven't had it for long, but it's growing well, and I have high hopes for a beautiful tree. Product received on time and packaged appropriately. You are starting from a seed! A unique gift for someone impossible to shop for. Ties into his interest in things Japanese. This gift will be used all year; not just the two days after Christmas.